2012 was the first year I set a reading goal for myself. I absolutely believe that in order to maximize our instruction and our impact on our students, that we need to be readers and writers ourselves. Twitter has provided me a Professional Learning Network of like-minded educators who seem to be (hard to be positive with just 140 characters, but I'm pretty convinced!) amazing educators and amazing people as well. They are constantly sharing recently released titles and fantastic reads that students are sure to love. From a reading standpoint, I was incredibly excited about having the freedom that summer brings and the opportunity to have free time to accomplish even more reading. For whatever reason, that hasn't really happened this summer. I've picked up numerous titles I have around my house and spent plenty of time at libraries and browsing e-books online. Nothing has really struck me. I revisited Daniel Pennac's Reader's Bill of Rights and was instantly thankful for the very first right of a reader: The right to NOT read. I know many of us have experienced reading ruts and often, they can not always be explained. I do know, however, that one of the best ways to find my way out of a reading rut is to revisit one of my favorite authors. Jordan Sonnenblick has brought me back to reading. While I've only read a couple of his books to this point, his writing possesses the unique ability to take me through a wide range of emotions within one text. I love this and I also love that I have been able to multitask while "reading" one of his books today. 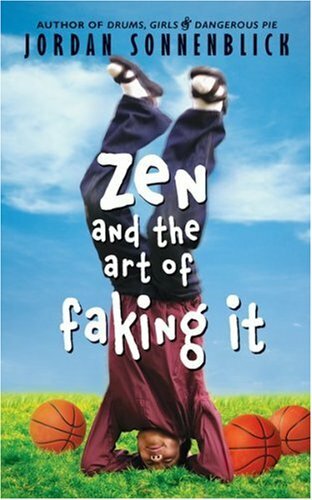 I haven't always enjoyed audiobooks, but the audio version of Zen and the Art of Faking It has brought me back to reading and also opened my eyes to the joys of audiobooks (was aware of the benefits for students previously, but had not always enjoyed them myself).